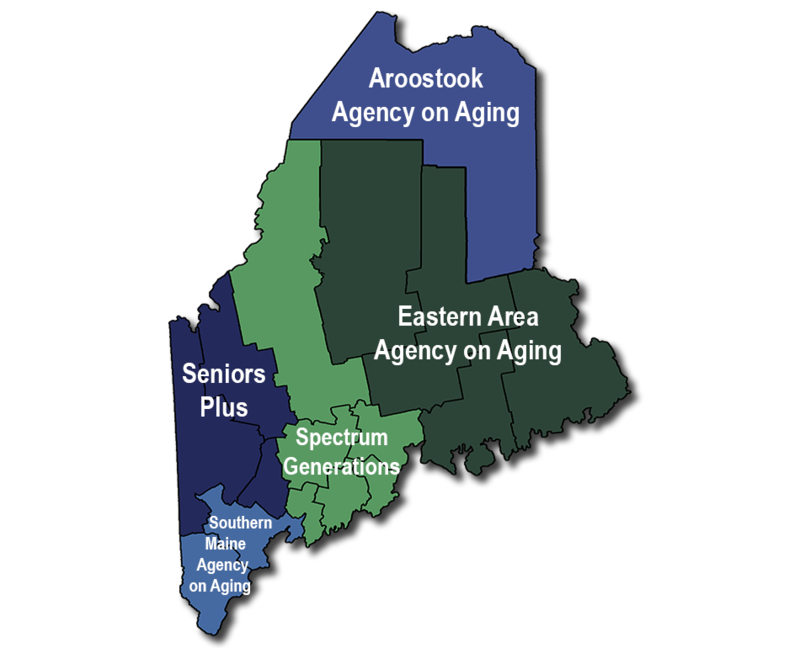 Maine’s five Area Agencies on Aging/Aging & Disability Centers are designed as the main access point for information and assistance for older and disabled adults. Callers get information on benefits and care options and are connected with services. The Aroostook Area Agency on Aging, based in Presque Isle, is one of five Area Agencies on Aging that promotes independence, dignity and economic self-reliance for Maine’s 200,000+ seniors. EAAA is an independent, nonprofit 501(c)3 organization managed by a professional staff and governed by a volunteer Board of Directors, comprised of representatives from their four county service area. They have a regional volunteer advisory council to help us identify the needs of seniors and find ways to meet those needs. Incorporated as the Western Maine Older Citizens Council, SeniorsPlus, located in Lewiston, Maine has been serving the needs of seniors since 1972. One of Maine's five Area Agencies on Aging, SeniorsPlus is a private non-profit, 501(c)(3) corporation, serving as the Aging and Disability Resource Center for Western Maine (Androscoggin, Oxford, and Franklin Counties). Southern Maine Agency on Aging's mission is to improve the quality of life for older adults, adults with disabilities, and the people who care for them. Counties Served: Kennebec, Knox, Lincoln, Sagadahoc, Somerset, Waldo, and Cumberland (Brunswick & Harpswell only). Spectrum Generations' mission is to promote life-long learning, health, wellness, nutrition, community engagement, and social well-being of all older and disabled adults.